Building a successful coaching practice requires commitment to yourself, to your clients and to your outcomes. I can help you create an empowering future and a road map to get you there, but you have to be ready, committed and willing to put in the time and resources to make it happen. But before you commit to a particular path or strategy, I want GIVE you something to help you feel more confident about whatever's next. 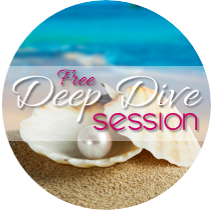 So please accept a free Deep Dive coaching session as my gift to you on your journey. This is not a sales pitch disguised as a free session. There will be no tricky psychological tactics or sneaky sales scripts, I promise. It's not about getting you to buy a coaching program, nor is it a 'free taste/pink spoon' session. But it's not just a casual chat or a 'pick my brains' conversation, either. It's a deep, life-changing coaching conversation. My aim is to give you a transformational experience that you'll remember for the rest of your life. In the process, we'll have a chance to see what it would be like to coach together. I guarantee it will be worthwhile. Other coaches might charge anywhere from $300 to $1000+ for this type of support. I'm going to give you my undivided attention for up to 2 hours, free of charge. In return, all I ask is your willingness to be honest and go deep. You'll either love it and want to keep going, or you'll leave feeling full and needing nothing further. If you're ready for your free Deep Dive, fill out the form below. I’ll be in touch within 24 hours with further instructions. I loved our Deep Dive session and especially how you stuck with me until I finally was able to see what I've kept in hiding. I'm surprised that I could have such a shift in a short period of time! The experience was powerful, calm and transformative. A lovely element was the mix of spiritual and practical, via a do-able exercise that really showed me how to access my heart. I feel a renewed sense of enthusiasm and hope for my business, and most importantly I feel more confidence in myself. I could not believe the effectiveness of the questions. It was like you knew what I was thinking even though I didn't even know. I was guided down a path so gently and easily -- it was just a wonderful experience. Thanks Kathy for totally over-delivering! For a long time I felt I had the right pieces to make a winning online business. But I wasn't arranging them in the best way- I was stuck, feeling frustrated. You helped me sort and re-arrange the pieces so they fit me and serve my ideal clients. My focus is clearer, I see why I'm making changes and I know my next steps. I'm invigorated and so is my business- thanks to you! I felt like I received some great insight and like you really focused on my strengths. I moved from feeling really stuck to feeling really motivated with a clear place to begin. I hung up and immediately began pouring out onto paper a detailed summary of areas of focus, bullet points to be covered in a workshop setting, marketing taglines, etc. - all with a surprising amount of energy and ease. I have a new level of confidence, some great tools, and a different energy for my focus. I'm very excited to get going on the ideas that have been popping up since our call. Thanks! Thank you not only for pulling out the stuff I didn't even know existed but providing excellent advice/suggestions based on your experience. It was fabulous.